Where in the world is this box coming from? I've been having this access issue for months. When I run this particular program this login box pops up. When I enter my credentials a 404 appears, but if my teammate logs in (same computer) the program works as expected. I've been harassing the team that owns this server, but they insist that I have the same exact access as my teammate. I've spoke with all the experts of this program and they haven't been able to help. Where is this box coming from? I'm using IIS Express (only option) URL: http://localhost.company.com:8808, so why would a server login appear when I'm running something on localhost? 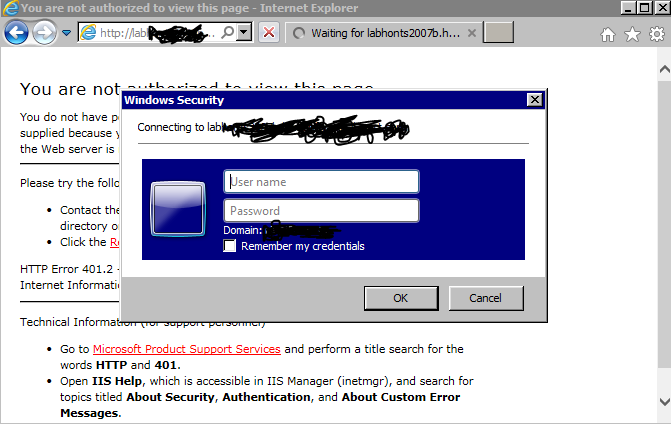 The lab server (scribbled out) isn't located anywhere in the code, nor is it located in the applicationhost.config of IIS Express. Is it that company.com is redirecting localhost.company.com to this lab server?Is there anyway I can tell what access I'd need to run the program on this server? What questions should I ask the team that owns the server (they know very little)? Note: I can view the files on this lab server, but cannot login with remote desktop, which is what I think I'd need to be able to run my program through it. $25 reward, payment method of your choice, if your post leads me to being able to run this program with my credentials. I've had this problem for months so it'd be well worth it. Thanks for reading. Replies To: Where in the world is this box coming from? Re: Where in the world is this box coming from? Looks like the standard windows IE security popup. If this is internal you should be able to add the URL to your IE->options->security-> local intranet or trust sites list. See if that helps. Are you still having the problem? If so then do you have access to the code? I assume not. I would look in the System Events if possible. I am not sure where to look however. Does the error happen immediately after going to the page? I assume so. I would go into the debugger before going to the page or I would cancel the popup then go into the debugger then refresh the page. I'm still having problems. After I replaced a seemingly unrelated SQL Server connection string in the web.config, I'm magically able to log in now and the website appears, but I get a ODBC driver error when I click on a different page. Using SSMS I'm able to connect and query the old and new databases. This is the error I'm getting now with the new connection string. In "ODBC Data Source Administrator" (32/64 bit versions open the same box) I added data sources that connect to the server with drivers "ODBC Driver 11 for SQL Server" in "System DSN" and "User DSN" It passes the connection test. But how would I know what driver I would need for this? SQL Server is keeping secrets from me by not telling me what connection string and driver it uses to connect. I see drivers "ODBC Driver 11 for SQL Server" , "SQL Server", "SQL Server Native Client". The connection string wont allow you to specify DRIVER. So how could I find what connection string SQL Server is using because that's able to connect fine, but my program throws JDBC errors. All the documents I read can't tell me what connection string and driver my SQL Server uses. How could I reverse engineer this fiercely protected information? The site was already listed under trusted sites. I'm still having problems. I do have access to the code. I looked at some events but couldn't find much. This login box isn't my problem anymore if I can get the new connection string to work. It does happen immediately. System.ArgumentException: Keyword not supported: 'driver'. Why would you be using ODBC and not something like 'System.Data.SqlClient'? You say "JDBC errors". That is important. I know very little about JDBC but after searching the internet I see that it does not use ODBC. An important question is if the JDBC connection is using Windows Authentication or SQL Server Authentication. SQL Server Authentication requires that a username and password be specified but Windows Authentication does not. A connection in a server is likely to use SQL Server Authentication. Apparently you need to look in a "Java properties file" (whatever that is) and/or the Java source code. The following articles hopefully will help. Using 'System.Data.SqlClient' got me passed that error. Thank you. I got another error because it was looking for a table that wasn't in the database. So I made some changes, but my changes didn't appear to compile, so I deleted my bin folder. Which caused the famous error "Parser Error Could not load type <Namespace>.<Class>". I'm still trying to work through this error I'll give an update when I do. Thank you Sam I'm going to go over those references. I'm getting the same ODBC "Data source name not found and no default driver specified" error but now for an Informix database. I think there's something wrong with my environment the code works for other people. Update: The connection string had the driver as "Informix", but in my ODBC the driver is called "IBM Informix ODBC Driver". I changed the connection string and now it's working. Let me check a few things then I'll post about the reward. If you are trying to use ODBC for JDBC then it might not be working because, as best I see, JDBC does not use ODBC. Is It Ok To Put Linux In The Ceiling?